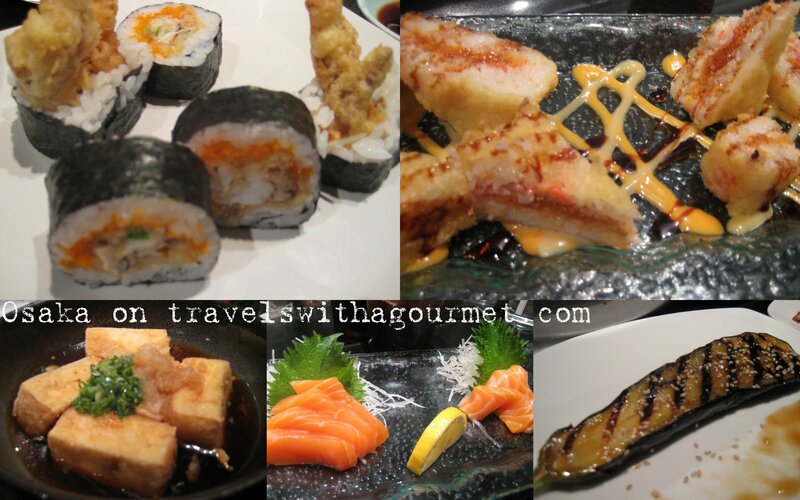 Our craving for sushi and all things Japanese had to be sated so we went to Osaka, one of our Las Vegas Japanese favourites for lunch twice since we arrived. It’s an unassuming restaurant with dark interiors, a sushi bar, teppanyaki tables and some tatami tables. We always end up sitting either at the sushi bar or near it so we can watch the sushi chefs slice and dice the fish and make the different rolls on the menu. The other day, we had lunch specials – beef teriyaki bowl, a nigiri sushi set and a bento box set of tempura and teriyaki. The second time we had lunch there, we sat at the sushi bar and ordered sushi rolls including the spider roll of soft-shell crab and their 2009 sushi inventions of Japanese sandwich – spicy tuna and salmon sandwiched on two pieces of rice, covered in breadcrumbs and deep-fried then sliced down the middle like two sandwich triangles. Along with that, we also had salmon sashimi, a negi-toro temaki (fatty tuna and chives in a hand-rolled seaweed cone), tofu-agedashi (deep-fried bean curd), skewers of grilled chicken yakitori and grilled eggplant with miso. Osaka is another of those off-strip places that are consistently good and priced right. The quality of the raw fish is very good and the service is friendly. Here’s another tip – if you go on their website and fill in a very short survey (3 questions) plus your email address, then they send you a 10% coupon for your next meal at the restaurant. I’m saving my coupon for my next visit. *Open till late. Happy Hour at the sushi bar from 5-7 p.m. with free sake for all sushi orders.